We here at Beech Bend take pride in serving delicious, affordable food. Whether you’re craving some chicken strips, can’t wait for a meatball sub, or are feeling like a healthy chef salad, we’ve got it. Check out some of our restaurants and menu options below; we think you will be quite impressed. We accept MasterCard, Visa and Discover at all locations. Located across from Tiki Island, Tiki Grill serves sub sandwiches, pizza, hot dogs, grilled chicken sandwiches, fresh salads and a cool favorite, Snowie Shaved Ice! Soda, bottled water, Gatorade, Red Bull, popcorn, candy bars and nachos are also on the menu. Complementary ice water is available at the window. Our Most Popular Restaurant! 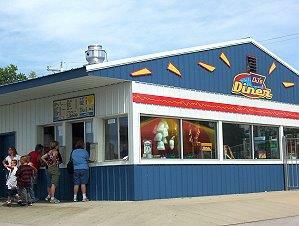 DJ’s Diner is located close to the park entrance and serves both the water park and ride park. 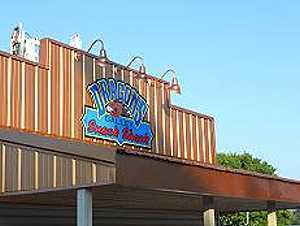 DJ’s serves burgers, hot dogs, corn dogs, fries, chili cheese fries, chicken strips, pizza, nachos, funnel cakes, soft serve ice cream and more. Drink options include: sodas, Gatorade, bottled water, Red Bull, and freshly brewed sweet tea. Complementary ice water is available at the windows. 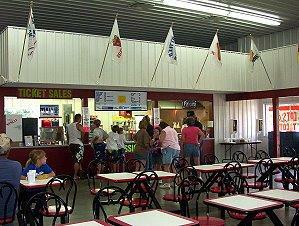 Located at the exit of the Kentucky Rumbler, the Rumbler Cafe serves up some healthy alternatives. You can choose chef salads, subs, barbecue, nachos, pretzels, cotton candy and pizza. And for dessert, hand-dipped ice cream and homemade FUDGE! Drink options include: sodas, Gatorade, bottled water, Red Bull, and freshly brewed sweet tea. Self-serve complementary ice water is available in this building. 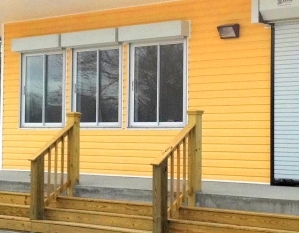 Beech Bend Hall is a gathering place for families and birthday parties! The sit-down restaurant doubles as an arcade and serves similar options as DJ’s Diner, plus grilled or fried chicken sandwiches (no funnel cakes). Drink options include: sodas, Gatorade, bottled water, Red Bull, and freshly brewed sweet tea. Self-serve complementary ice water is available in this building. 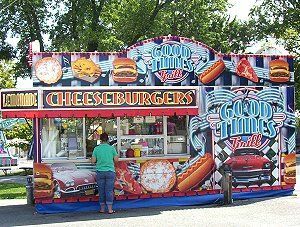 Located near Gold Rush Golf, Good Times Grill offers burgers, fries, chicken, nachos, and funnel cakes. To drink we have sodas, Gatorade, bottled water, Red Bull, freshly brewed sweet tea, and you’ve gotta try our FRESH squeezed lemonade! Complementary ice water is available at the window. Dippin’ Dots, the Ice Cream of the Future! If you haven’t tried Dippin’ Dots yet, you’ll have to on your visit! 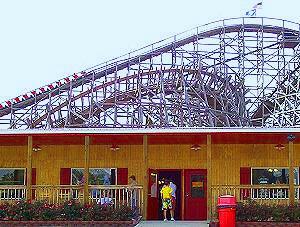 Located beside the Go Carts, Dippin’ Dots is also the place to buy your Go Carts tickets. Cool off at Hawaiian Ice! Hawaiian Ice offers refreshing options for our guests. Located across from the Wild Mouse, Hawaiian Ice serves shaved ice in 6 flavors, hand spun COTTON CANDY, and fresh squeezed lemonade! Other drink options include: sodas, Gatorade, bottled water, Red Bull, and freshly brewed sweet tea. Complementary ice water is available at the window. 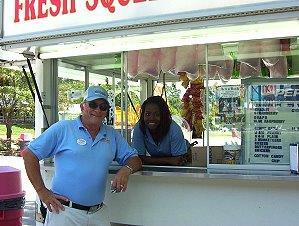 Located next to the Sea Dragon, Dragon’s Galley offers the popular Snowie Shaved Ice. Grab some nachos and cheese or a pretzel while you watch a show at the WBKO stage! Drink options include: sodas, Gatorade, bottled water, Red Bull, and freshly brewed sweet tea. Complementary ice water is available at the window.